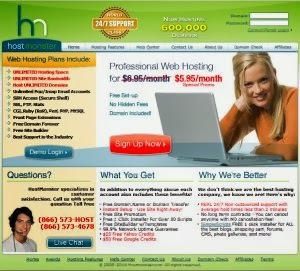 Hostmonster has been a great web hosting provider since day 1. My initial impressions of Hostmonster were good; their website is professional and their signup process was smooth and simple. Hostmonster was one of the first web hosts I ever found that offered pretty close to unlimited everything (storage, bandwidth, email accounts etc.) Needless to say, I was a bit skeptical at first, but they have proven themselves several times over to be a great web host that has exceeded my expectations. Ok, well, not everything – but pretty close! Hostmonster’s web hosting service is great value because you really will only ever need one hosting account. Once you have subscribed to the web hosting service at Hostmonster, you can add on as many domains and subdomains as you wish, and host & transfer as many files as you like without any additional fees. While you can use about as much as you can of storage, email, and bandwidth, Hostmonster’s web servers can really only handle so much. While it is technically unlimited, these types of servers are not designed for large company websites and highend web applications that require greater resources. Additionally, you are “sharing” the server with other users which means the stability and security of the server would be less likely than a dedicated server option. With all that said, Hostmonster’s shared hosting plan should be more than sufficient for about 80% of websites. The single web hosting plan offered by Hosmonster cover’s a wide range of web hosting needs. The shared web hosting plan offers excellent value for the small to medium websites.